For the past 25 years we have collected, bought and sold the most rare and desirable Autographed treasures, Vintage Movie Posters, Historical Memorabilia, antique toys, and other RARE antiques and collectibles. Over the past several years we have fallen prey to the joy and investment potential with High Quality Fine Art, particular oil paintings from some of the most talented artists of the last three centuries. Although we have acquired some great work from popular American Artists, it has been the stunning classic landscapes, villages and ships at sea from Demark , Norway and other European countries that has captured our admiration and often leaves us in awe. 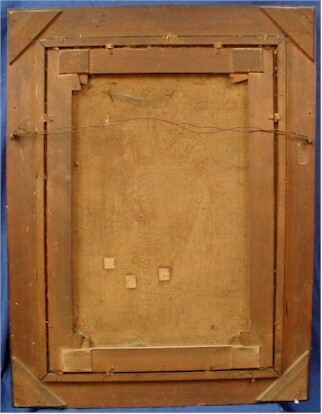 Our collection is comprised of 18th, 19th Century and early 20th Century. Our exciting collection embraces primarily Realism, but also ventures into Abstract and Impressionism. 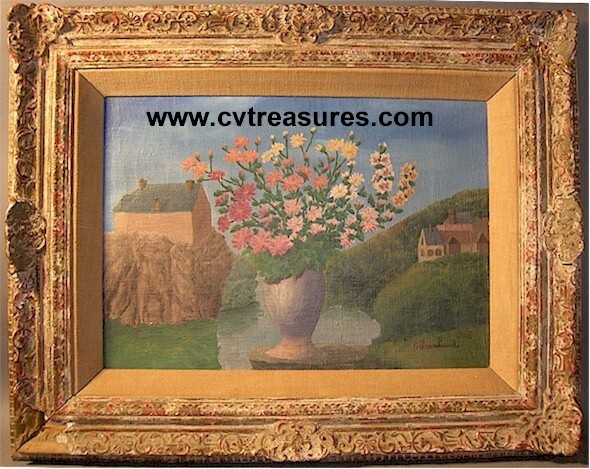 Most of our vintage art is signed by a "Listed Artist" and for some we list auction result examples for that artist's work. On others without a signature? Well, these were such incredibly amazing works of art, we just didn't care if there was a signature or not. One such example is the amazing "Well Feed Gentlemen-Lord". Not signed, but what an astonishing piece. We think you will agree. Sold Out but if you have any to sell please Contact Us. Also if you are looking for particular fine art Contact Us and/or Sign Up for our Free Monthly Newsletter to be notified when new acquisitions arrive. (1908 - 2000) Born in Hanoi , Vietnam and graduated from the Exole des Beaux Arts de Indochine in 1931. In 1932 he Obtained a scholarship for further studies in sculpture in France but later left sculpture for painting but remained in France until his death. In 1949 he moved to the south of France and became a neighbor of Marc Chagall who greatly influenced his work. Vu Cao Dam is one of the important Vietnamese painters of the 20th century. 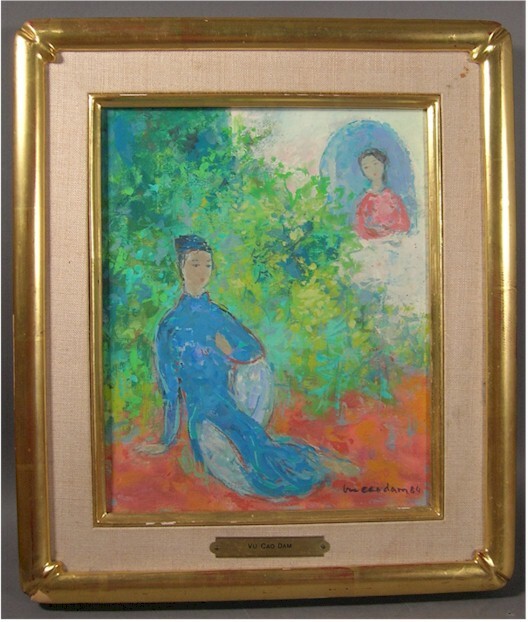 Item Description: VU CAO DAM (Vietnamese/French, 1908-2000), female figures in garden, oil on canvas, signed and dated '84 l/r, bears world renown Wally Findlay Gallery label on verso. Meticulously professionally framed and double gilded high quality fabric matting. Size: 11"h, 9"w (not including frame). About 12x15" framed. For the Connoisseur of museum quality art, not much needs to be said about the intense demand for Southeast Asian art and in particular Vu Cao Dam and the value of his work. So, we invite you to do your own online search and soon you will realize Vu Cao Dam is one of the most important and high-demand Southeast Asian artists on the market. His work continues to shatter auction estimates and more importantly the value of his work, ESPECIALLY Female Subjects oil on canvas, continues to soar. "Vietnamese paintings performed remarkably well as a whole, once again solidifying its attractive acquisition value in the market. The category was led by Vu Cao Dam's La Conversation, a sublime ink and gouache on silk piece from 1944. The auctioneer closed the sale at $246,000, breaking our own world auction record for the artist at $114,000 (Sotheby's Singapore , 4 April, 2004). " Highlight from the Vietnamese section of the auction - Girl Combing Hair by Nguyen Phan Chanh was sold among electrifying bidding in the saleroom and on the telephone. Increments were escalated swiftly and the painting was finally sold for $216,000. In line with Phan Chanh's painting, Mother and Child by Nguyen Cat Tuong conveys the revolution of the role of women in traditional Vietnamese society. With fervid bidding, the painting was sold for $90,000, five times the low estimate of $18,000-25,000. Auction record was also fetched for Portrait of a Vietnamese Mandarin by Vu Cao Dam when it was sold for $96,000"
Spectacular portrait of "Ann Perls". The colors, detail, subject, table objects, background painting onto which he applies his signature make this an exceptional work of art and one of Fiene best. 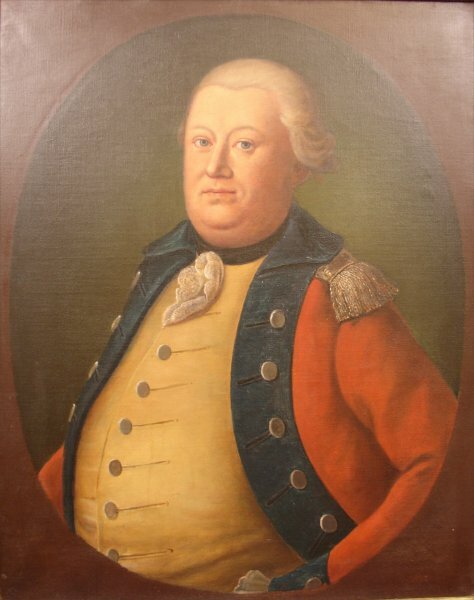 Although he was primarily known for his city scenes his often produced some remarkable portraits. This is the best portrait, based on our extensive research on hundreds of his paintings, he has ever produced. The closest style of work very similar to this we could find is the one which sold in the early 90's for $8800, which was much smaller and we believe not in the same extraordinary category as this one. Refer to the image of it provided. 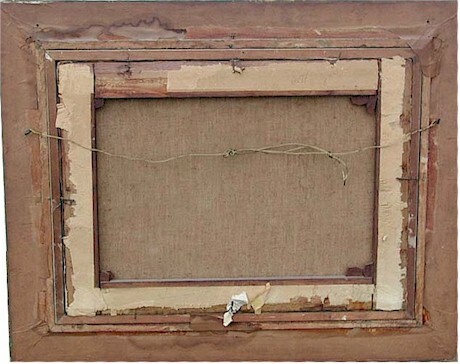 It comes in a high quality frame which appears to have been framed in the 40’s or 50’s. 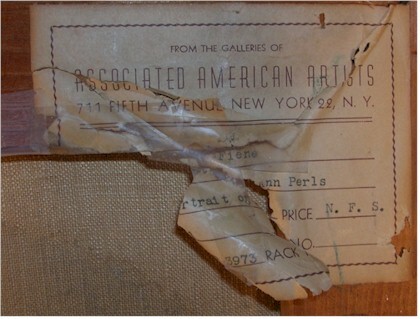 The original Gallery label from Associated American Artists in New York is still attached, but is torn and has become fragile. Also has a label from an old auction sale on back. 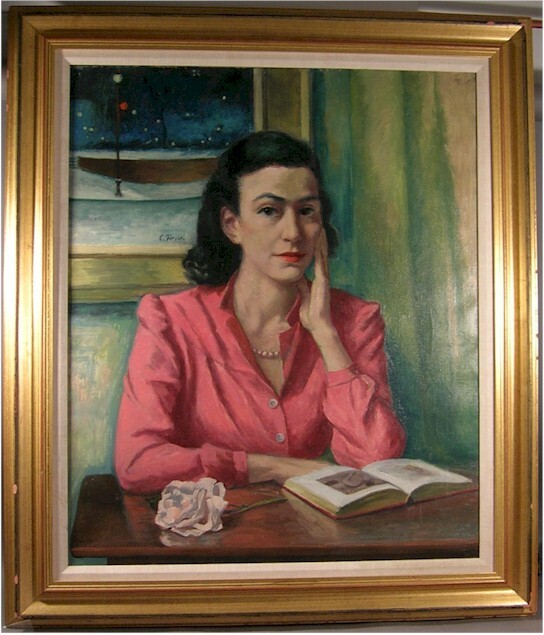 Both labels identify this as “Portrait of Ann Perls” by Ernest Fiene. 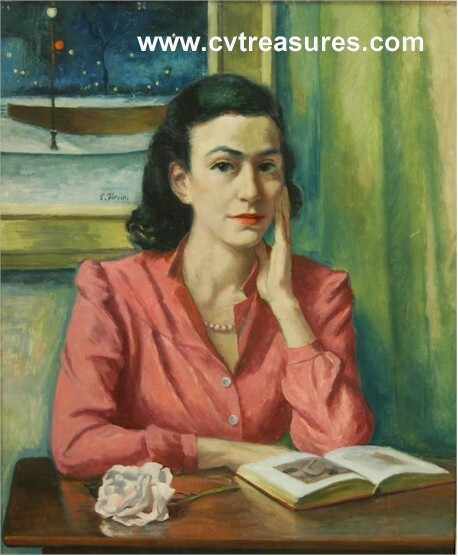 He has SIGNED onto the “inside painting behind Ann Perls head, “E. Fiene” . Refer to images. Artist: Ernest Fiene (1894-1965) is a highly listed artist with a strong history of appreciation based on hundreds of auction sales. This sales history includes works selling for as high as $40,000. Based on our research of hundreds of his paintings, our impression is this is one of the best works of art he produced. Hence, we think our asking price is quite reasonable considering the quality and high demand of this artist’s work. 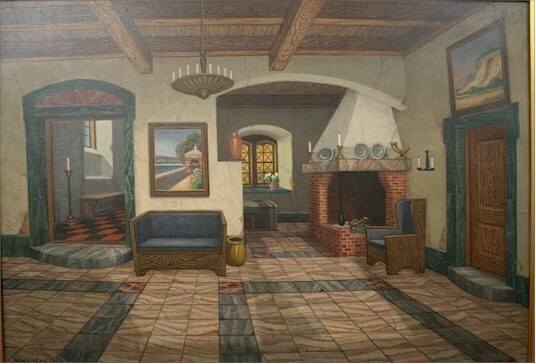 Fiene, born in Germany , became a naturalized citizen of the United States in 1927, having spent the previous fifteen years studying art at various New York institutions and building his reputation as a painter of American scenes. 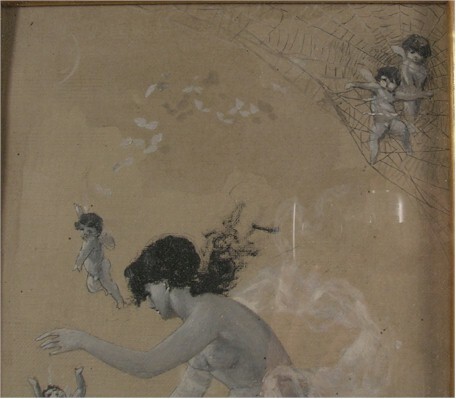 A fixture on the faculty of the Art Students League, he was also a prolific artist with a body of work spanning many media, from etchings to frescoes. A teacher and artist, Ernest Fiene created works in many media but was noted primarily for his landscapes of American scenes. He also did portraits, etchings, lithographs, murals and book illustrations. 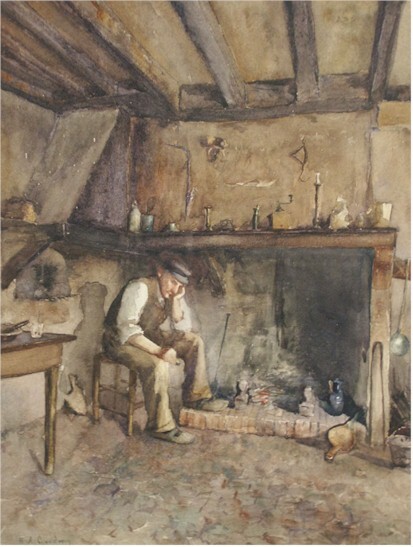 Unlike many of his contemporaries, he refused to isolate technique from subject matter, and incorporated his interest in human life and his optimism about humanity into his paintings. He was born in Elberfeld , Germany , came to the United States in 1912, and was naturalized by 1927. He studied at the National Academy of Design from 1914 to 1918, at the Beaux-Arts Institute of Design from 1916 to 1918, and was also at the Art Students League and in Paris at the Academie de la Grande Chaumiere. From 1938 to 1964, he taught at the Art Students League and was also a member of the supervising faculty of the Famous Artists School in Westbury , Connecticut . A stunning "Flowers in Vase" with a touch of surrealism. 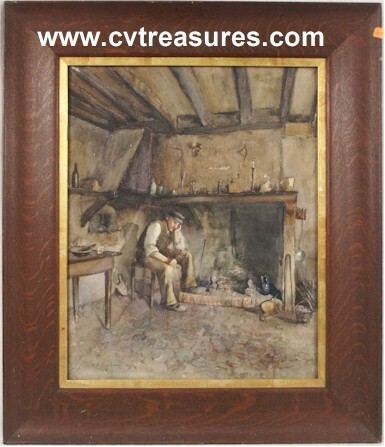 One of the nicest Bauchant paintings we believe available, based on our extensive research on this artist. 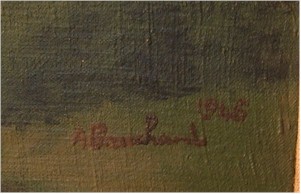 He has signed l/r "A Bauchant 1946". 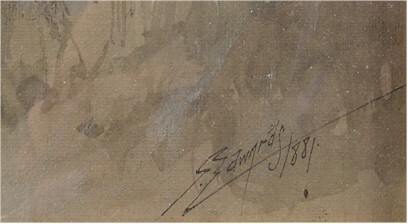 In his typical signature but has also added the date, which he rarely did. 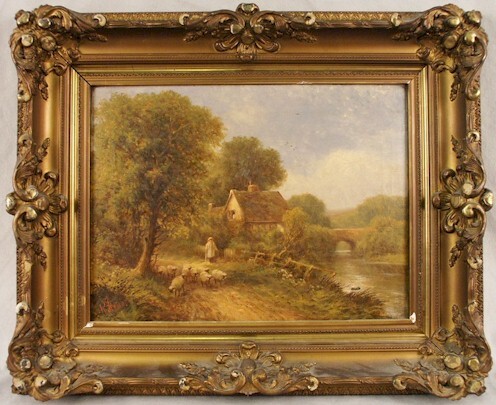 Come with the beautiful original period French style ornate frame. 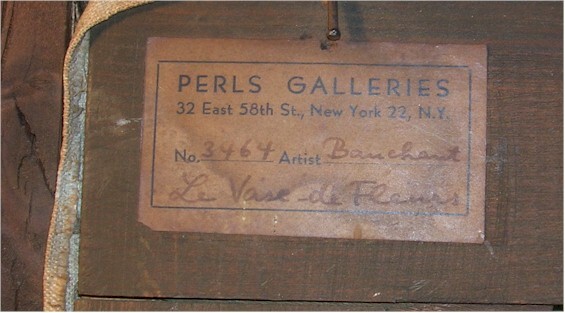 Bears the gallery label "Perls Gallery NY". Andre Bauchant is a very important early 20th Century French artist. He worked as a gardener until 1914 and began painting five years later after serving in the army. During his service, he displayed an aptitude for drawing as was trained as a mapmaker. 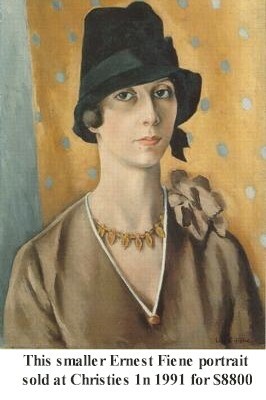 Returning home, he pursued an art career and held his first show at the Salon d’Automne in 1921. His preferred subjects came from history and mythology. So, you can see a touch of Surrealism in some of his better works, including this piece. The French artist André Bauchant (1873 -1958) was a horticulturist by profession, and his work is marked by his close affinity with nature and his passion for ancient mythologies. This catalogue raisonné offers for the first time a comprehensive overview of Bauchant's art and provides the basis for a re-evaluation of the work of an artist who was often positioned in the shadow of his far more famous colleague Henri Rousseau. This is an exceptional work by Bauchant in detail, color and subject. In particular you will note the touch of Surrealism in a few of his works of art. Most of his florals are typical on a table in a vase with solid background. However, note our piece on one of the links below to get a feel for the unique implication of a surreal background. When buying art for investment or enjoyment it is best to look for that artists oeuvre, in other words what he/she is primarily famous for. 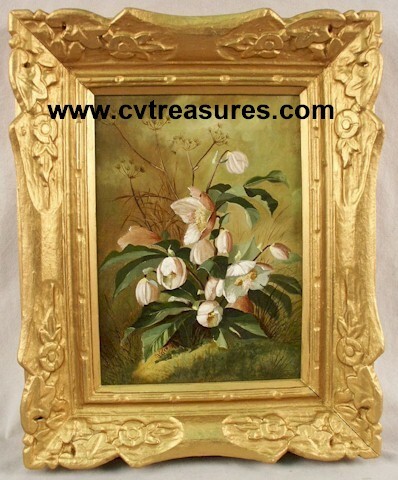 Such as in this example Bauchant is most famous for his Floral art. August Schenck (1828-1901). 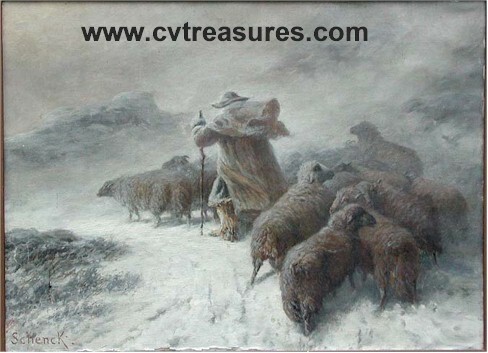 Spectacular still life of Shepard with flock on mountain side during blizzard. 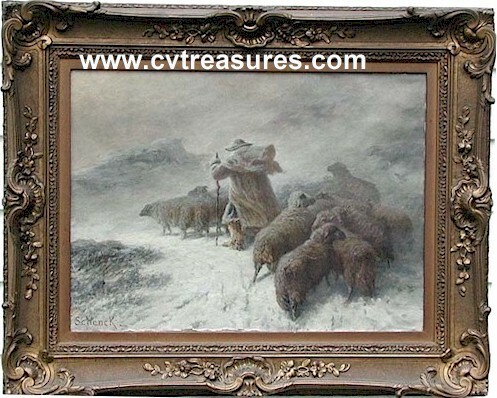 Artist: August Schenck is a well listed Danish artist, best known for some of the most breath-taking still life Shepard/Sheep paintings in existence. There are nearly 100 auction listings for him. If you are a collector of magnificent still life 19th century art, you will be hard pressed to find an artist that can capture a scene with such incredible detail and emotion. The detail, colors, background, and passion in this piece requires no verbal explanation. This is the best we have ever seen! 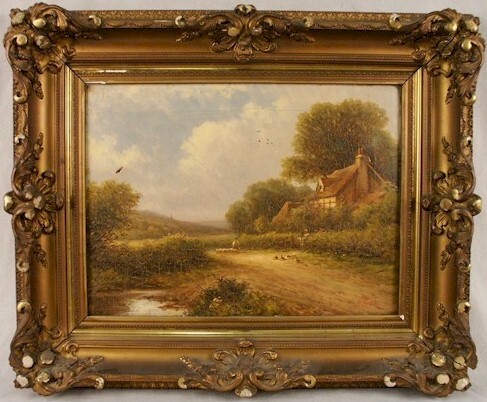 Come with gorgeous original period ornate frame. Condition: Very Good, no tears, holes or repairs. Original high quality oil painting on canvas. 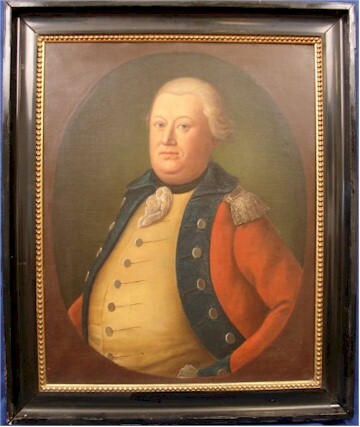 An excellently portrayed portrait of a well-fed gentleman in official clothing. Great facial detail, use of colors and light. CONDITION: Very good. No missing paint, holes or tears. Please see the photos. 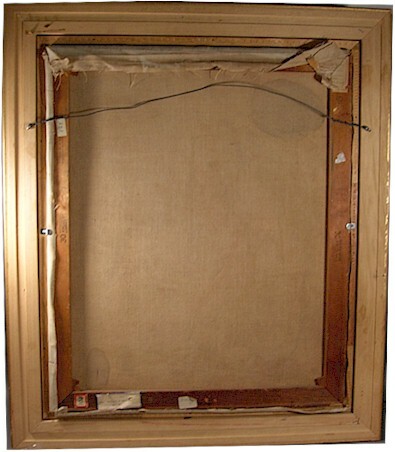 The frame shows signs of wear and tear. . SIZE: 25" by 31" (64 cm by 79 cm) without the frame. 31 1/2" by 38" (80 cm by 96 cm) with the frame. 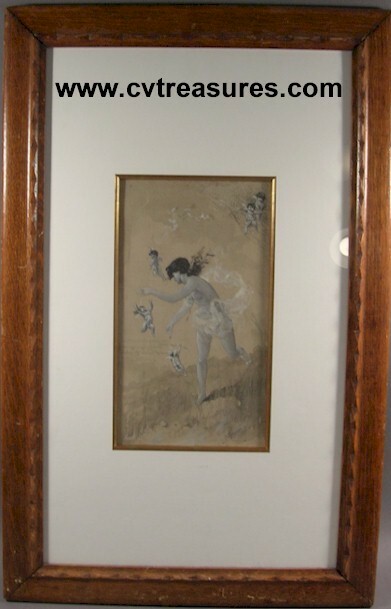 One of the nicest Vintage Fine Art pieces we have acquired in some time! Just breathtaking! Original high quality oil painting on canvas. 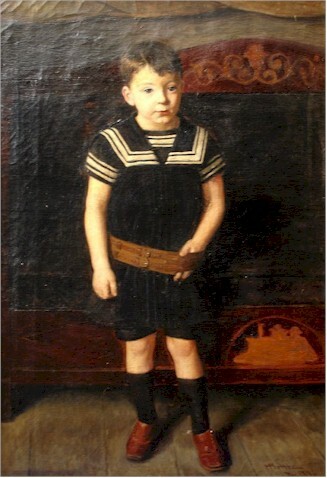 An adorable portrait of a little boy. Exceptional detail. 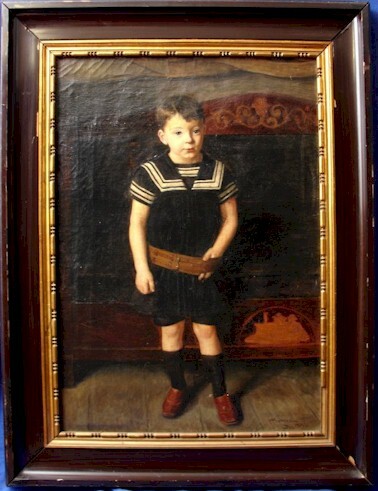 The artist captures the innocence and youth of the boy to perfection. Good lighting and color use. 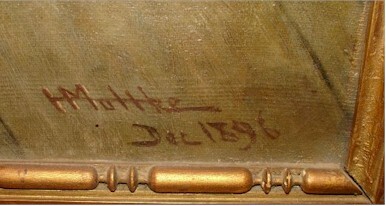 ARTIST: Signed "H. Moltke". 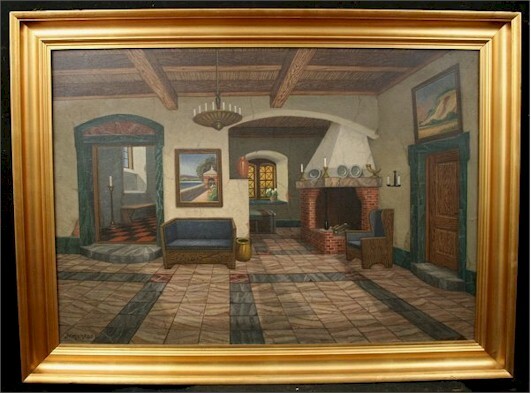 Harald Viggo Moltke (1871-1960) is a VERY well-listed artist with over 100 auction listings on Artprice selling in an excess of $20,000. This may be one of his finest works. He grew up in Yorkville , South Carolina but after his father’s death, he returned with his mother to Denmark . He went to Kunstakademiet (the Academy of Fine Arts ) in Copenhagen in the years 1889-1893. Harald Moltke was a member of Arctic Council and an honorary member of Frederiksberg Literary and Art Association. As an artist he followed scientific expeditions in North Atlantic expeditions. Around the turn of the century he joined the famous Knud Rasmussen on a trip to Greenland at a literary- art project where a big illustrated work about Greenland was to be made. Unfortunately he caught a serious disease that lamed him. It became an obstacle for his work the rest of his life. In 1903 during the convalescence he finished his main work "Portraits of the Inuits at Kap Horn". He also made portraits of his fellow travellers Knud Rasmussen and Mylius-Erichsen. Harald Moltke was an important Charlottenborg painter and exhibited in England and Germany as well. His works are represented e.g. at National Museet in Copenhagen , in Vejle and Frederiksborg Museum and in Søfartsmuseet at Kronborg. CONDITION: Very good. Some professionally made repairs. No missing paint, holes or tears. Please see the photos. 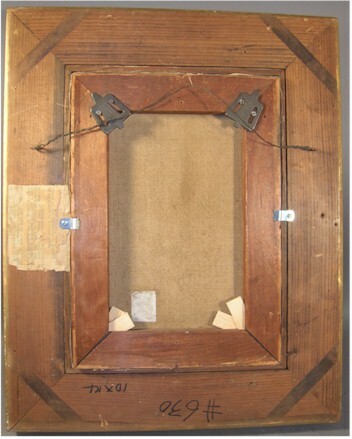 The frame is in a good condition. Minor signs of age. Can be hung as it is. SIZE: 21 1/2" by 31" (55 cm by 79 cm) without the frame. 30" by 39 1/2" (76 cm by 100 cm) with the frame. One of the best quality art pieces from a very important artist we have acquired in a long time. 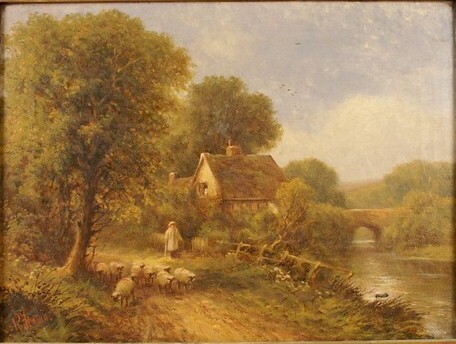 Well known for his Shepard and sheep landscapes. 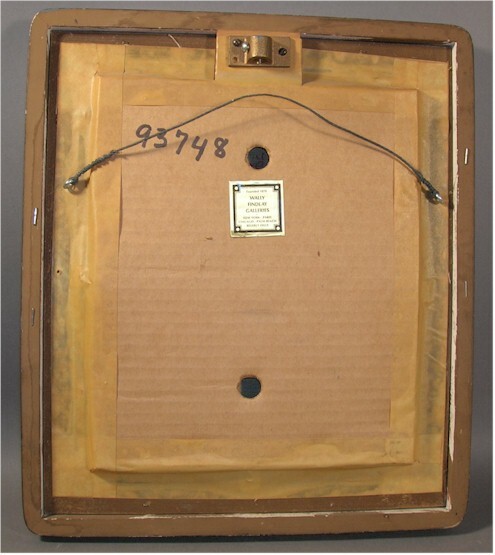 BY researching Davenports or Artprice you will discover his Shepard works are in high demand. Furthermore, his trends continues to be higher then auction estimates, so where it stops nobody knows. 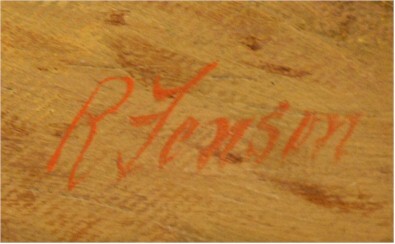 First one is Signed in the lower right, second in the lower left, "R Fenson". Here are two breathtaking landscapes of Sheppard's leading their herds. The first is the Shepard leaving for the fields, the second is the Shepard returning home. Beautiful landscape, cottage, stream. Just an incredible background to the main subject. A great pair with great continuity. The colors, detail, and mix of subjects creates an exceptionally stunning work by this highly talented 19th Century artist. 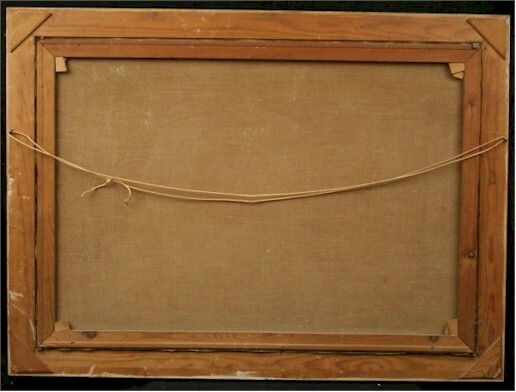 Each is in original period, museum quality frame that are exceptional compliments to these works. . Size: 12x16 unframed, 18x22" framed. Condition: Excellent. Each has a minor 1/2 tear that is easily corrected. 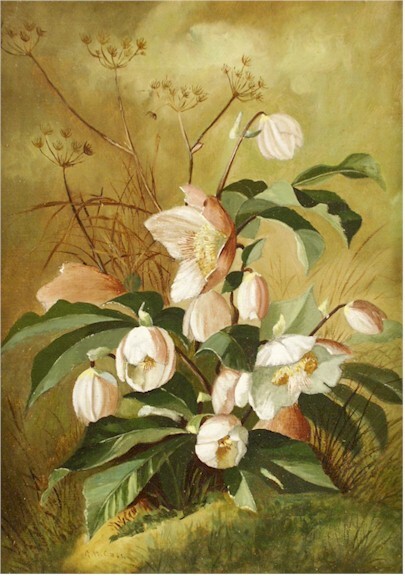 Striking Oil on Canvas Still Life of Hellebore Flowers. The detail, colors and background lighting are amazing! 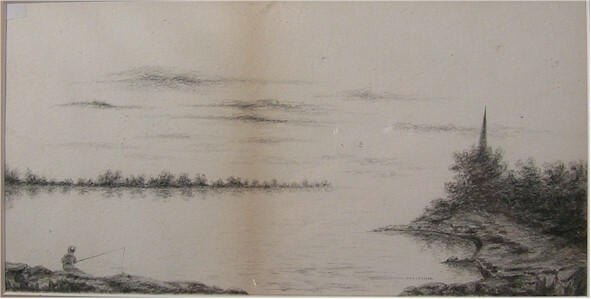 Artist: GEORGE N. CASS (American, 1831-1882) signed G. N. Cass, l.l.. Size: 14 x 10 1/4 inches, 21x17" framed. 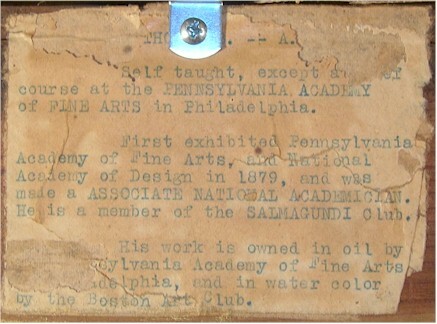 Other provenance: On back is part of a bio label about Cass and his association with the Boston Art Club in 1879. 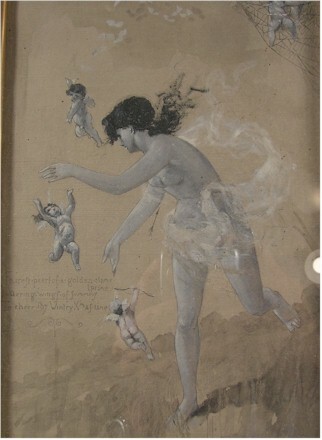 G. Edwards (George Edwards) - 1881 - Pencil and Watercolor Illustration of Woman with putti, signed lower right "G Edwards, 1881". Left of Woman reads "Fairest pearl of a golden clime-prime, hovering wings of summers. To cheer thy wintery Xmas time". A stunning piece with great detail and imagery unlike anything we have seen before. 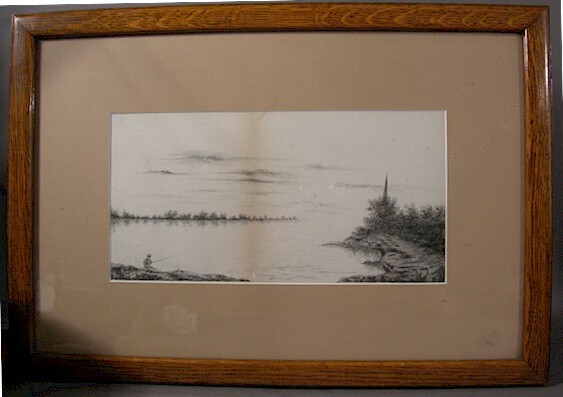 Image size if 6.5" x 12". In frame 28 x 17.5". Recently re-framed. Double gilt matted in a quality oak frame. George Edwards Sales History: Several Listings as high as $26,000 in 1993. Whether they are carved in wood, cast in bronze, sculpted from stone, or painted on canvas or plaster, putti are endearing symbols that suggest love and romance. But what exactly are putti? The word putti is used by art historians to describe the engaging and angelic creatures of which artists are so fond of including in their works. 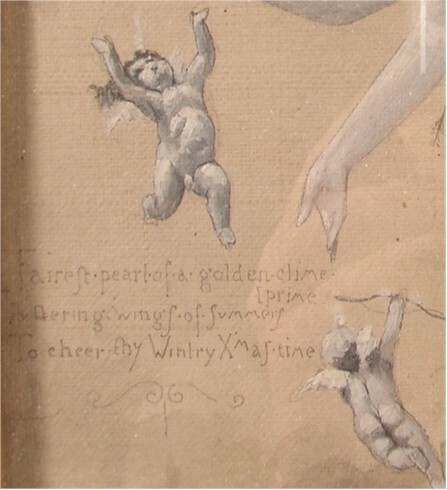 Putti (singular - putto) usually resemble adorable chubby children or babies, and they are often depicted with tiny wings that allude to their celestial origin. In Italian Renaissance art, putti are famous for stealing adoring glances at the Virgin Mary in Raphael's Sistine Madonna. However, putti were also quite popular with artists during many other artistic periods. These childish cherubs frolic in the romantic Rococo paintings of Franзois Boucher, for example, and additionally adorn a myriad of other magnificent pieces throughout the history of art. Since these winged creatures are found in many works of art - both fine and decorative - they naturally acquired a mythology of sorts. For putti are used to allude to the presence of love, or even used to represent love itself. They are derived from artistic depictions of Eros (who was known to the Romans as Cupid), the Greek god of love and desire. Indeed, one famous representation of Eros is the Hellenistic work of sculpture known as the Sleeping Eros. So the next time you see an angelic little creature smiling from one of your favorite works of art, you can be sure that love is in the air. 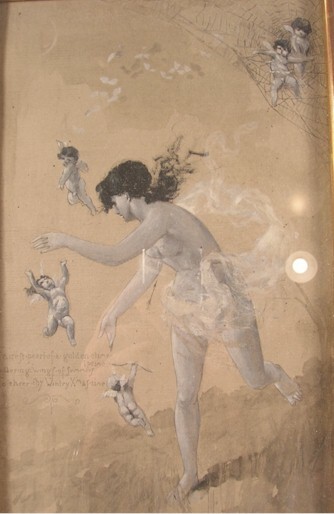 Early 20th Century Charcoal . Still life. Fishing on a Tranquil Lake . Van Vranken is a Very Well Listed Artist. Price example – He sold “Departing Spring” for $9,400, Bonhams & Butterfields – The United States: California , Los Angeles , April 8, 2004. Date: Early 20th Century. The original newspaper backing mention President Grover Cleveland which is late 19th Century. 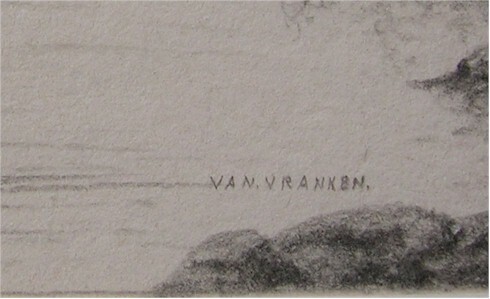 However, since Van Vranken was born in 1890, this may have been one of his earliest pieces. Condition: Very Good. There is a light acid line that can be seen in the photos. This is a result of being under a non-acid free mat for about 100 years. We replaced with an Acid free mat but left all original newspaper and frame backing in tact. Original quality oil painting on canvas. A large size interior in an elegant style. Incredible detail and composition. 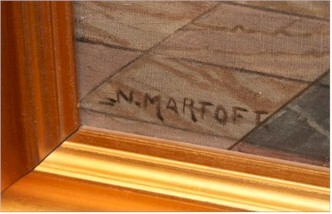 ARTIST: Signed " N Martoft ". Niels Martoft (1878-?) is a listed artist. DATING: First part of the 20th Century. CONDITION: Very good. No missing paint, holes or tears. Please see the photos. 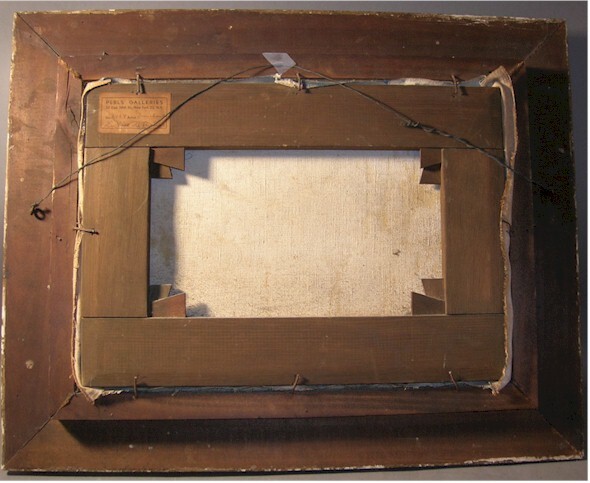 The frame is in a very good condition. Ready to hang. SIZE: 39 1/2" by 27 1/2" (100 cm by 70 cm) without the frame. 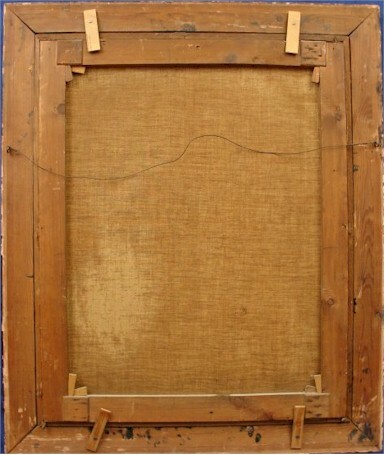 45" by 33" (114 cm by 84 cm) with the frame. 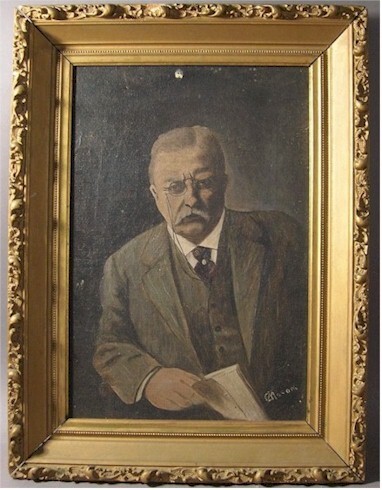 Striking Original turn-of-the-century Original Oil on Canvas portrait of President Theodore Roosevelt. A interesting expression, looking almost impatient with the artist, Roosevelt looks reluctant to complete this work of art. But, an exceptional image resulted. A beautiful vintage artwork of this intriguing figure. 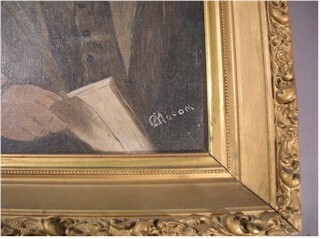 The artist signature is "C Masoni (or Mosoni). We have not researched this artist. Size: 21 x 15" framed. 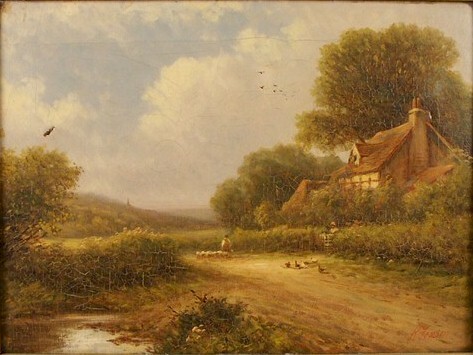 Date: Circa 1900. 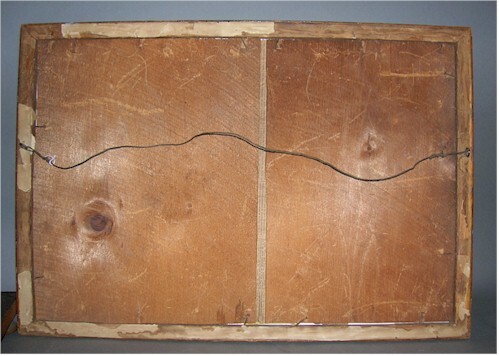 Frame braces on back stamped "Pat Feb 1883". 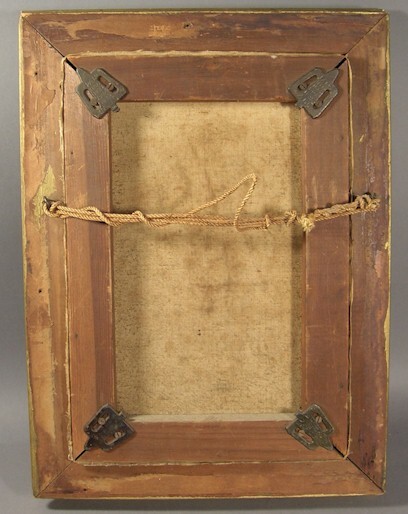 Is in Original period ornate frame. Magic Poster - 19th CENTURY - STUNNING ARTWORK - EXTREMELY RARE!